I've been waiting for the lavender in my garden to blossom to be able to make my own Herbes de Provence mix. I had so much extra lavender that I thought I'd make our family's favorite dessert. Yes, crème brulée strikes again! Lavender has a strong floral taste, so a little bit goes a long way. To enhance the lavender aroma, I added lavender extract that I bought at Sur La Table store in Palo Alto. I really thought that the unusual flavor would turn off the kids but my little munchkin loved the lavender dessert the most and kept saying "It tastes like a flower, I love it!" It's the third season we're planting lavender in our garden and I've learned that the variety most commonly used for cooking is English lavender, not French! 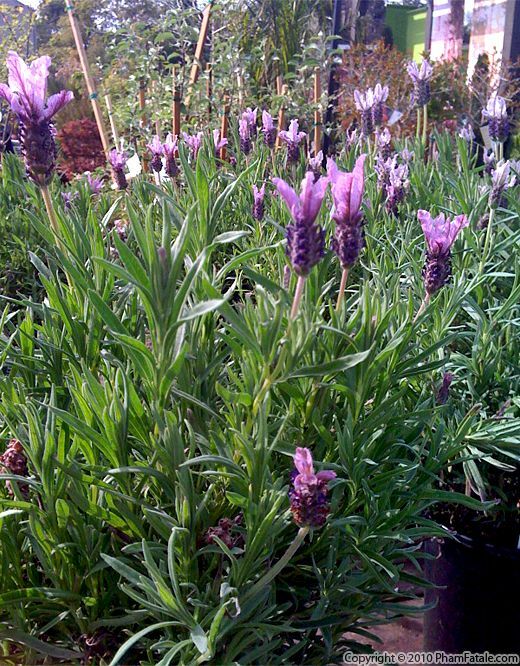 So be on the look-out English lavender the next time you stop at the nursery. If you're searching for a fancy French dessert for your next dinner party, try this recipe! On the practical side, you can make the cup dessert 'way in advance and create the sugar crust at the last minute. That way you can focus on your guests instead of dessert while still serving something fabulous. Your guests will be in awe. 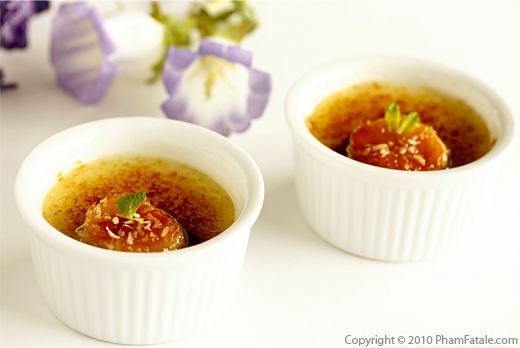 A journalist contacted me this week and asked if she could use my crème brulée photos. Not that I need much prompting, but it got me thinking of crèmes brulées and I thought I could try out some new flavors. I happened to have baby bananas in the house, along with some leftover shredded coconut from making lima bean curry. The mini bananas come from Guatemala. They are very sweet and flavorful. I caramelized them in sugar and used them as garnish. I flavored the custard with the shredded coconut, rum and banana extract. The result is a very pleasant dessert using ingredients that are available this season. Can't wait for spring to experiment with more flavors! Crèmes brulées are my mother-in-law's pêcher mignon, which literally translates to "cute fault" in French (which means guilty pleasure). I keep telling her that these custard desserts can be flavored with anything and she keeps challenging me. She brought home a whole case of blackberries from our local market and asked if I could make her favorite dessert cups with them. So after flavoring crème brulée with lemon, cherry, butterscotch, matcha green tea and masala chai, I was able to prove to her that I still have a few tricks up my sleeve. It has occurred to me though that maybe her "challenge" is just an excuse to get me to make more crèmes brulées. As long as I can come up with more flavors, I'll keep playing along. After that, she'll have to come up with a better reason! 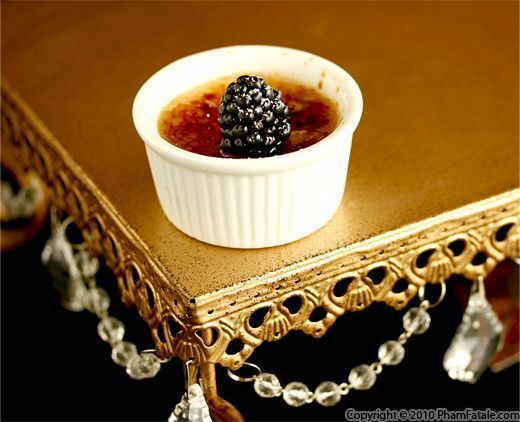 I wanted to make a crème brulée that was absolutely packed with cherry flavor. No subtlety here. I'm talking full on, Witches of Eastwick levels of cherry flavor. To accomplish this, I added cherry extract to the custard, and placed a layer of stewed cherries at the bottom of each bowl. 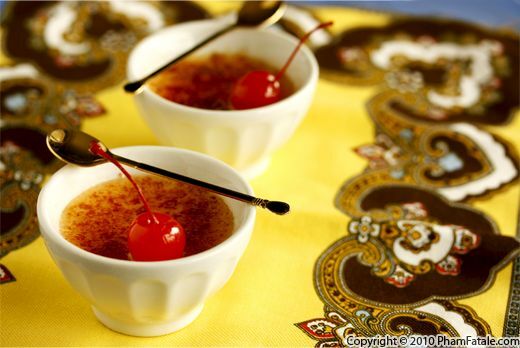 I finished each dessert by serving it with a maraschino cherry. It's not cherry season yet, so I used frozen cherries. They are picked at the peak of ripeness, so they taste great. When thawed, frozen cherries can lose their form, but since I was stewing them, the shape of the cherries didn't matter so much. Cherries may not immediately come to mind when you think of winter desserts, but their ready availability in a variety of forms that are great for cooking make them an excellent choice. 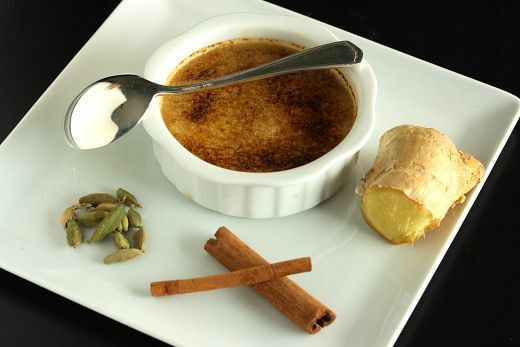 This version of crème brulée is flavored with the spices that are used in masala chai. Cloves, cardamom, ginger and cinnamon give the dessert the distinct flavor of masala chai combined with the richness of a French custard. I wasn't sure how it would turn out, but after the first bite it has become my favorite flavor. Don't get me wrong; lemon, butterscotch and green tea are great flavors, but the masala spices are absolutely intoxicating. I'm not a big tea drinker, but whenever we have a party and serve masala chai, I end up drinking all the leftovers. What can I say, I'm addicted. Even though the flavors of this drink are fabulous, it's probably good that I don't drink this particular tea that often because of its high caffeine content. 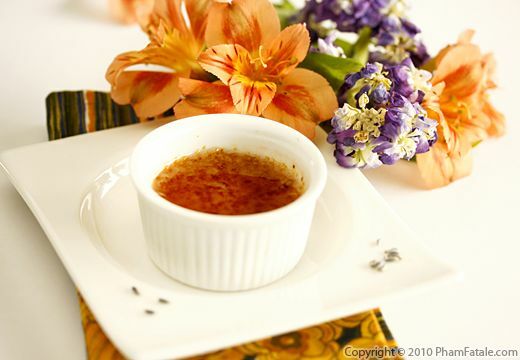 Masala chai crème brulée has as much caffeine as a cup of masala chai, along with all the fat that is found in a crème brulée. Something else to keep me awake at night! Page 2 of 4 pages.